Period Architecture’s mission is to orchestrate and guide the best possible experience for homeowners. To create physically, aesthetically, and functionally enduring architecture, the company offers expert architectural design and property planning services that conclusively address the needs and interests of their clients. Once so entrusted, Period Architecture not only provides the design and planning, but will also identify the builder, consultants, engineers, historians, and craftspeople as needed. Together, the assembled team is lead by Period Architecture, realizing homes that will be loved now and enjoyed by generations to come. Master-planning is offered at many levels from researching standards, codes, and ordinances to comprehensive property planning to the phases of the construction process. A program narrative, unique to each project, results from a thorough understanding of each client’s wishes and aspirations. As such, the narrative reflects the owner’s values and is assembled to systematically guide the process to its natural conclusion. Period Architecture specializes in the design of custom residential architecture and has earned accolades for its collective skill and knowledge. Regardless of the style or scope, whether for new residences, additions or restorations, the success of the design depends on trust and communication. From the beginning steps of any project, Period Architecture pilots and inspires the collaborative association that brings the client, architect, builder, and consultants to the table. Period Architecture’s design studio prepares hand-sketched perspectives and digital or physical models that allow for careful analysis. Regular presentations to the client illuminates the design process, engages the client’s active participation, and results in synergistically evolved solutions that address the program narrative. Period Architecture offers clients steadfast guidance and advocacy through the entire process. From concept to design to the completion of construction, Period Architecture manages expectations, coordinates consultants, assists in the selection of allied professionals, documents key project information, and monitors quality from beginning to end. At the core of Period Architecture are its people. Each member of the practice is a respectful partner in a process that is intimate and personal; they are skilled in time-honored design principles, and they believe in the transcendent value of architecture. 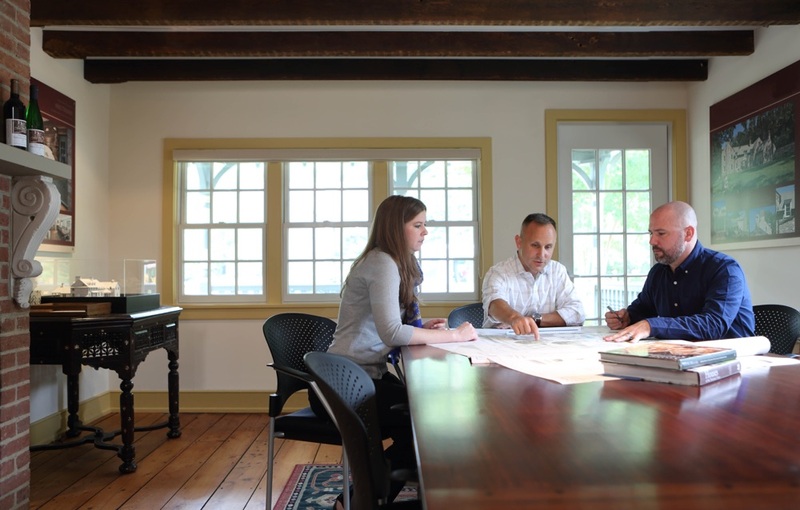 Keenly aware of the challenges for homeowners, each individual at Period Architecture works in tandem to ensure a transparent, successful path for their clients.